That became especially evident to Tori Ward ’13 and Sophie Burke ’13 while conducting research on climate change this past July in Sweden. During their month at the Abisko Scientific Research Station some 200 kilometers north of the Arctic Circle, they lived and worked alongside scientists from around the world, including Canada, Germany, Bangladesh and Sweden. “It was great to be in another country and to realize how international science is, especially the earth sciences,” says Ward, who is studying hydrology. Ward and Burke received Summer Undergraduate Research Fellowships from the Hamel Center that enabled them to participate in the inaugural summer of Northern Ecosystems Research for Undergraduates (NERU), a UNH summer program directed by research associate professor of biogeochemistry Ruth Varner and sponsored by the National Science Foundation. The nine students in NERU—representing seven different colleges and universities—designed individual projects related to climate change. After a month at UNH doing preliminary work, the group headed to Sweden to collect data. Ward’s research examined the effect of precipitation on the release of soil hydrogen, an area that has received little attention from researchers. “In order to understand global warming, we need to know more about this process,” says Ward. It’s expected that increased precipitation and thawing of the permafrost (frozen ground) will lead to wetter soils, causing more hydrogen to be released, Ward explains. Increased hydrogen levels may contribute to warming by trapping greenhouse gasses such as carbon dioxide and methane in the atmosphere. 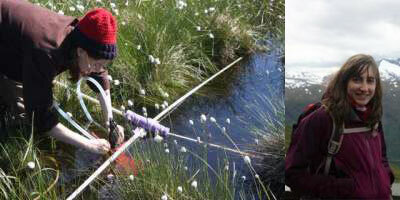 Sophie Burke '13 takes methane gas measurements in local peatland. Burke focused on the impact of warming on the amount of greenhouse gases released into the atmosphere by peatlands. “We’re finding that peatlands, when they work properly, can be huge sinks of carbon,” Burke says. Now, with global climate change, peatlands are “turning from sinks into sources of carbon.” That shift is occurring because the warming of the atmosphere is thawing the permafrost and causing a release of trapped carbon. One of her findings was that the July 2012 samples from thaw ponds contained a higher percentage of methane than those from peat, possibly because of characteristics of the thaw ponds such as their vegetation and moisture content. Ward and Burke will use their data from Sweden as a basis for their senior theses and expect to present their results at the American Geophysical Union Fall Meeting in San Francisco this December. They both plan to attend graduate school and credit Varner with helping them develop as researchers. Editor’s Note: To read more Ward’s and Burke’s projects, visit the NERU blog. Each year in October, the Hamel Center for Undergraduate Research marks the academic homecoming of IROP students with the IROP SYMPOSIUM, brief illustrated research presentations crafted for a general audience of faculty, students, administrators, supporters, families, and invited guests. The special anniversary edition of the International Research Symposium will be held during Homecoming on Friday, October 12, from 2-5 p.m. in MUB Theatres 1 and 2. Written by Sonia Scherr ’13MFA. Photos courtesy Northern Ecosystems Research for Undergraduates blog.